Enter a name for the new handler here. 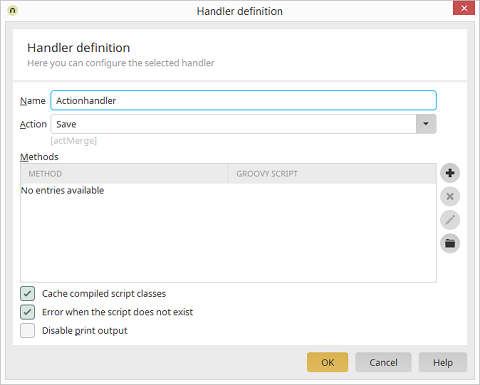 If you are defining an action handler, select the desired action underneath that will be used to trigger the script. This option is not available for rendering handlers. The method is stated here. States the path to the referenced Groovy script file. Script is run before the request is processed. Only for action handlers. Executes after a request, before a process is run. Executes at the end of a process. processAfter: The reverse order from above. Removes the method currently selected in the list. Opens the Groovy Script Editor. Opens the Groovy file manager. The compiled Groovy script classes are stored in the cache. Displays a message when the referenced script is not found.